Map Generator for Hans im Glück's "Hazienda"
Version 1.10 now supports multiple languages of the user interface by implementing language packs. The first additional language provided is English. HAZIENDA - the new, big strategy and development game with simple rules! Argentinia in the early 19th Century. Endless pastures covering the pampas. You own sufficient money to acquire land and cattle and to establish a small hazienda. During the game, you will develop your hazienda, increase your herd, acquire new land at different locations, open up new markets and take care of water supplies and harvest. But you must keep an eye on your opponents. The winner is the player with the largest and most important hazienda at the end of the game. The game comes with two diferent game boards, each requiring different startegic skills. In addition, there's a variant with an alternative scoring system, again requiring different strategies. In co-operation with Hans im Glück we are offering a freeware map generator. 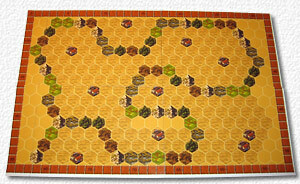 It generates and prints new maps for the game - ready to play and try new strategies. Either use the installation version, execute hazinst2.exe and follow the instructions, or download the zipped version and unpack it to a folder of your choice. Then simply start Haz11.exe and start generating maps. We provide the zipped version because the installation version may not work correctly on some Windows environments. The software created an INI file in the installation folder; should you see error messages reporting access right problems you must use a start parameter giving a folder of your choice to which you have full access rights (e.g. Haz11.exe C:\Temp\). First, here is an example of the original asymmetric map of the game: you can download the script file as an example for the Hazienda map generator. Just load the script file into the program to modify and print it. In addition, you find one of the asymmetric maps that was used during the playtesting phase of the game (as a script file and as a PDF file) for download. You can print the pdf file, cut it and mount it in order to get a complete board. If you want to reduce the size of the map for demonstration purposes you can reduce the hex size in the Programmoptionen dialog and print a smaller map in draft or graphic mode. As an example you can download the above map in a mini format as draft version and graphic version. 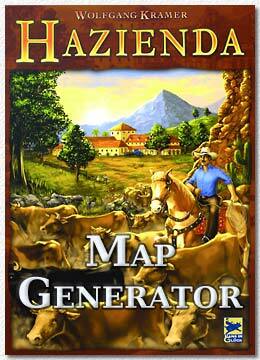 We are providing the Hazienda Map Generator with different language packs. In order to get the desired version for buttons, menues,and other in-game text you need to download the respective language file. Just unzip the files lang.ini and langhelp.txt into the game's install directory. Maybe someone out there is willing to translate this resource file into other languages? And if anyone would like to help us translating the help files into English we are happy to provide the resource files for that.